The Rumble Seat … The six wire wheels with wide white wall tires … The Packard trunk with matching luggage … The throaty rumble of the powerful straight eight engine … All combined to make the Packard Sport Coupe a favorite with the younger generation of the 1930’s. One of the greatest names in car building in the United States, Packard stood for fine engineering, long life, great sport and luxury cars, early racing success and technical innovation. Clearly identified by its yoke-shaped radiator and fluted hood, Packard projected an aura of prestige and excellence (especially in the years between the two wars) that was unmatched by any other make in North America. 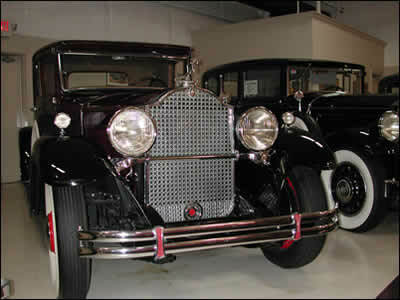 In fact, the car’s beauty, dependability and quality often resulted in the Packard name being compared with England’s Rolls Royce. This 1931 Packard has but 55,000 miles on the odometer. It has obviously been carefully maintained. Its history can be traced back to the day, over seventy years ago, that its proud owner took delivery from the showroom floor.